There’s no better indicator that summer in North America is in full swing than high temperatures and sunny skies. 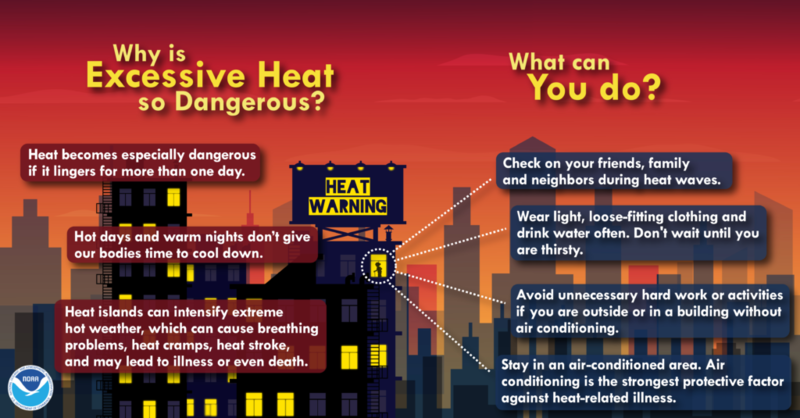 While most of us enjoy this kind of climate after a long, chilly winter, it is vital to understand the risk factors involved when such weather evolves into episodes of extreme heat. 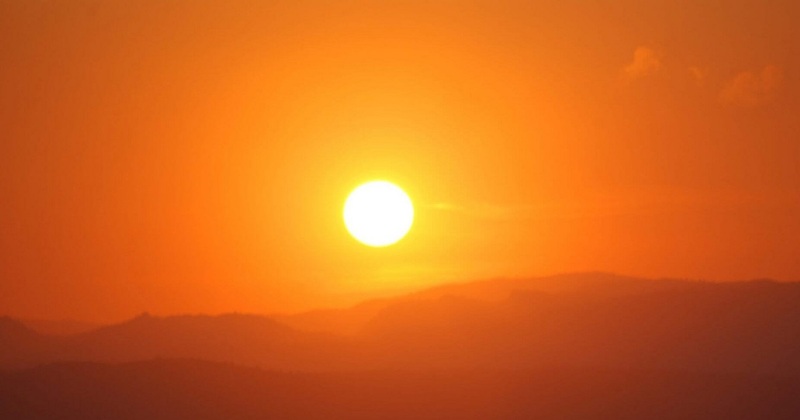 For many, the first week of July experienced brutal heat waves, as extreme temperatures and record-highs gripped much of the continent, from Montreal to Los Angeles. In the spirit of promoting preparedness and a Weather Ready Nation, we unpack extreme heat and the dangers that accompany it below, providing key guidance on how to enjoy the dog days of summer as safely as possible. For most of the country, extreme heat is defined as a period of at least two or three days with temperatures climbing above 90 degrees. High humidity can make this kind of weather feel even more severe, as general evaporation is slowed and our bodies are forced to work much harder than normal to maintain a safe internal temperature. In the most serious cases, people can die from this overexertion by the body. Death from extreme heat often tops the annual list of weather-related fatalities, and recent trends show no indication of an ebbing in the frequency of these heat waves. But what triggers such unseasonably hot weather? In the simplest terms, extreme heat waves are caused by the arrival of a system of high atmospheric pressure. These kinds of weather systems pull air from high up in our atmosphere down to the ground, where the air is tightly compressed and increases in temperature. These kinds of systems make it particularly difficult for cooler air to come into the area and break up the warmth, explaining why heat waves often linger for several days. Because of our changing climate, these high-pressure systems are becoming increasingly common and strong. It is imperative to keep yourself regularly updated on upcoming weather forecasts and know which days have the potential to bring extreme heat to your area. What can Extreme Heat do to me? Heat cramps are painful muscle spasms that mostly occur in the abdomen and legs. They serve as an early sign that the body is struggling to maintain a healthy temperature because of external heat. The best way to alleviate heat cramps is to move to a cooler environment and begin drinking fluids. Fruit juice and sports drinks are best because they contain sugar and electrolytes, but water never hurts. Avoid anything salty, and gently massage the affected areas to relax stressed muscles. 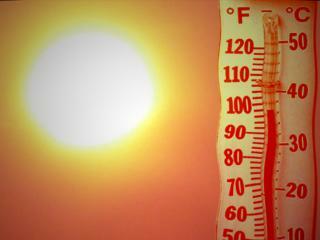 Heat cramps, while important to give attention to, are the mildest form of heat-related ailments. Heat exhaustion is a step up in severity from heat cramps and is characterized by headache, dizziness, nausea, weakness, and pale or cool skin. 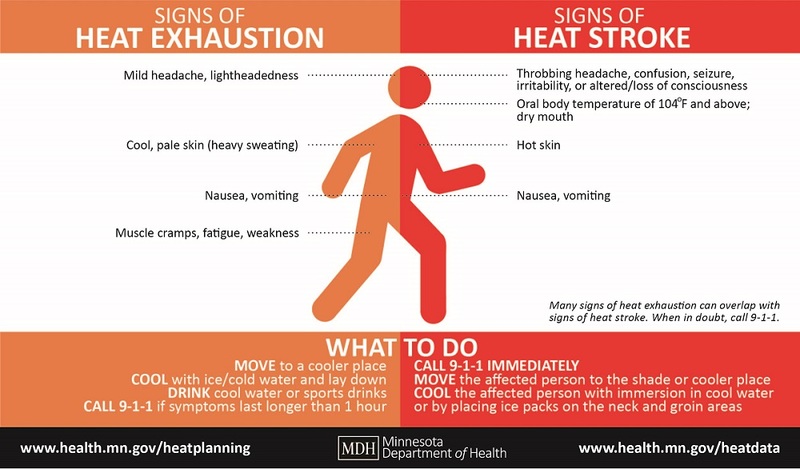 Heat exhaustion should never be ignored, and it is imperative to quickly relocate to a cool place with circulating air. Remove or loosen excess clothing, and use a damp towel to try to soothe the body. Drink small, regular amounts of water, and monitor symptoms for improvement. The most dangerous heat-related condition, and the one requiring immediate medical attention, is heat stroke. In these cases, the body systems become completely overwhelmed with heat and begin to shut down entirely. Extremely high body temperature (above 103 degrees), weak pulse, red skin, and vomiting are all signs of heat stroke, which is life-threatening. If these symptoms appear, call 9-1-1 right away, and immerse the body in cool water and/or ice. That last tip is where we come in. TigerSwan offers the GuardianAngel App, perfectly designed for situations like extreme heat crises. 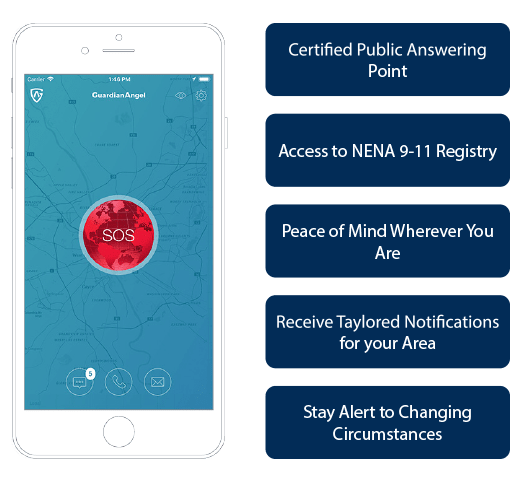 With GuardianAngel installed on your smartphone, users remain informed on weather advisories in their area and other pertinent safety developments with our mass notification system, making it easy to know when extreme heat is coming and when it will be at its most dangerous. Avoiding risk in the first place is the safest way to preserve your well-being in times of extreme weather. But in the unfortunate event that you find yourself in a moment where you suspect you are suffering from one of the three heat-related conditions, GuardianAngel users can contact a well-trained risk management professional at the push of our SOS button. Our team of crisis management experts will calmly guide you through your next move, serve as a liaison between you and local emergency personnel, and provide assurance and support through such a stressful time. There is no reason that high temperatures and sunshine should keep you from doing what you love this season, but it is in everyone’s best interest to remain informed on weather dangers, and able to seek relevant help when needed. Luckily, with our GuardianAngel Platform, you won’t be alone — we’ll handle the risk management for you, so you can get back to safe summer fun.